Nautical by Nature: Wedding update! Some of you have asked about my sister's upcoming wedding. I was dreaming of a summer Martha's Vineyard wedding (the fiance's family has a house there) but alas this isn't my wedding ;) They are going to have a winter destination wedding! The wedding will be very small (under 30 people). I won't be revealing the exact location until we are on our way but I am excited already! 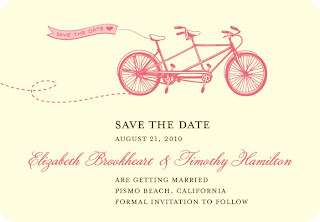 Then about a month after the wedding, there will a larger reception here in LA. I am helping my sister pick out things to have in a favor bag for each guest. I would love ideas from others who did winter weddings. So far I have handwarmers, hot chocolate, chapstick and maps/activity guides. I love the save the date magnets they chose! I have mine on my fridge. So cute! Where are they (the magnets) from? Those magnets are brilliant and so stylish! Those STD's are beyond darling. Love the bike! Love the idea of a StD magnet. Where are they from? Thanks! I love STD magnets! I have a wonderful one up on my fridge currently. What a great vintage-looking theme! Gift idea: I've seen jars with all the hot cocoa ingredients in it, including marshmallows on the top - then a bow tied around the jar with a card attached w/ instructions on how to make the hot cocoa. I've updated the post to include a link. My daughter is also getting married this winter in Cabo, Mexico in March. It is so exciting. I have this listing on my Etsy and wondered if you think she might be interested. I am donating this to my daughter and her fiancee.